The Peregrine Falcon is often called the fasted bird in the world. It travels at speeds of 40-55 km/h when flying and speeds up to 112 km/h when chasing after prey. It has a special dive called a stoop, where it dives from heights over a kilometre above the ground and pulls its wings in to reach speeds of 300 km/h as it drops! With its speed and manoeuvrability the Peregrine Falcon is able to catch birds in the air or pick out one bird from a flock. If you’re hoping to see a Peregrine Falcon be sure to look up. They like to perch in high places like on high-rises, radio towers or other tall structures in the city where they can survey a large area for prey below. Look for the distinctive black head which makes the Peregrine Falcon look like it is wearing a helmet. It also has bright yellow feet and legs and the sharp talons and hooked beak of a bird of prey. 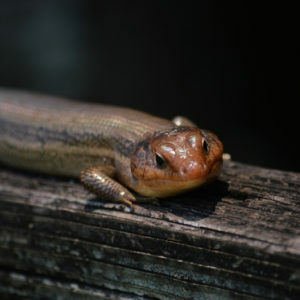 Another distinctive feature of this species is the broad, dark, vertical stripe on each cheek called a malar stripe. Between the 1950s -1970s Peregrine Falcons were only one of many species who suffered dramatic population declines due to pesticide poisoning from the chemical DDT in particular. At its worst the Peregrine Falcon was almost lost from the wild which spurred conservationists to act. The Peregrine Falcon was declared an Endangered Species and since then intensive recovery efforts have rebounded wild populations to a point where most are now stable or increasing. Today the Peregrine Falcon is still threatened by habitat loss and destruction, disturbance and persecution by people, and poisoning from environmental contaminants. 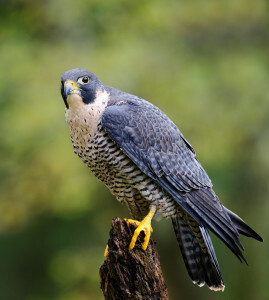 The Peregrine Falcon is one of the most widespread birds in the world, and is found on all continents except Antarctica. They nest on steep cliff ledges, or on tall buildings in urban areas. These birds travel to Central and South America to spend the winter. A couple of pairs are known to nest in Ottawa’s downtown area, and birds are often spotted along the Ottawa River. • As with most raptors, female Peregrine Falcons grow to be larger than males. • “Peregrine” means wanderer, an apt name since the population that spends the summer in the tundra, travels all the way to South America to spend the winter. This journey is a distance of 25,000km – one of the longest migrations of any North American bird. • The Ottawa Peregrine Falcon Watch (http://falconwatch.ca/) is an organization dedicated to the protection and recovery of the peregrine falcon. Volunteers monitor nesting Peregrine Falcons and assist young birds who are just learning to fly in an urban environment full of dangers. Check out the Falcon Watch website to learn more or to sign up to be a volunteer today!